From its joyful depiction, we can assume that the Ten of Cups embody happiness, joy, contentment and emotional satisfaction in your family, relationship or companion. It represents an idyllic state of comfort, harmony, peace and love which makes you feel like you are in paradise. This is where all your dreams, wants, needs and wishes have been fulfilled, and you feel a complete sense of satisfaction. Take a moment and breathe, look around you and be thankful for all your blessings. This card signifies something that so many of us are searching for. To see the Ten of cups is to indicate a true emotional fulfillment - one where the lonely self-satisfaction of the Nine of Cups is shared with others to create a true sense of community and family. It is the crystallization of the innocent will of the ace of cups. After learning how to love oneself, the Nine of Cups matured into the Ten of Cups, which at its core about how true happiness stems from forging authentic bonds and connections with others. This card is most associated with a sense of 'happily ever after' - of family, of lasting harmony and peace. To see the Ten of cups is to indicate a true emotional fulfillment - one where the lonely self-satisfaction of the Nine of Cups is shared with others to create a true sense of community and family. This is an indication of harmonious family, for the card shows you that you are living in the perfect peace. No more adjustments or shifting is needed, you are in the right, just relax and enjoy your moment. In a love reading, this card shows that it is romantic, real and genuine - and has a strong potential for something long term. It deserves all your effort to make it come true. 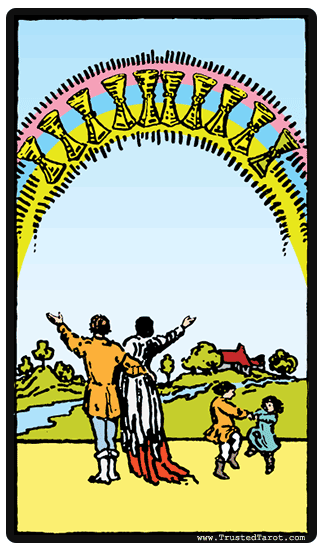 The Ten of Cups could also indicate a family holiday where you can relax and spend time with family members. When the Ten of Cups is reversed, the strong bonds that one forges with family and community are broken, or twisted. The Ten of Cups is truly the most 'happily ever after' card, but somehow this idealized image of domestic peace and comfort is broken, or was unrealistic all along. Instead of connections, you may find distance. Instead of coming together, you may be pulling apart. Your hopes for happy times and special moments seem to not meet your expectations. You should learn to treat each other well, love each other and care for each other. This is the best way to ensure that you retain your harmonious living.